Christmas party night, for some at least (personally my boss is so stingy, I'll be grateful for an extended lunch break), so time for a novelty record. 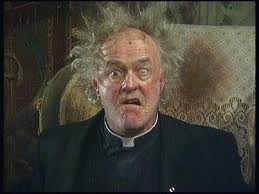 Frank Kelly is better known as the man who plays Father Jack in the TV series 'Father Ted', here he's Gobnait O'Lunasa gradually falling apart as he gets the ever-increasing presents of birds and people every day from the admiring Nuala. It probably doesn't bear repeated listenings, but it's pretty funny the first few times and I particularly enjoyed Day nine's "Listen, you Louser! You'll make an enemy of me yet". There's a few versions around imcluding an old Top of the Pops performance - so apparently it was a 'hit' some time - but I've linked to the one with the lyrics.